The discreet, little-known, but warm-hearted, residents of Bugey are proud of their history, traditions, and most of all, their land. They have an understanding with the soil: here, they give blood, sweat and tears to the vine on even the steepest of hillsides. And the vine gives back in return, producing wines full of character: reds, whites, rosés, still wines and bubblies. 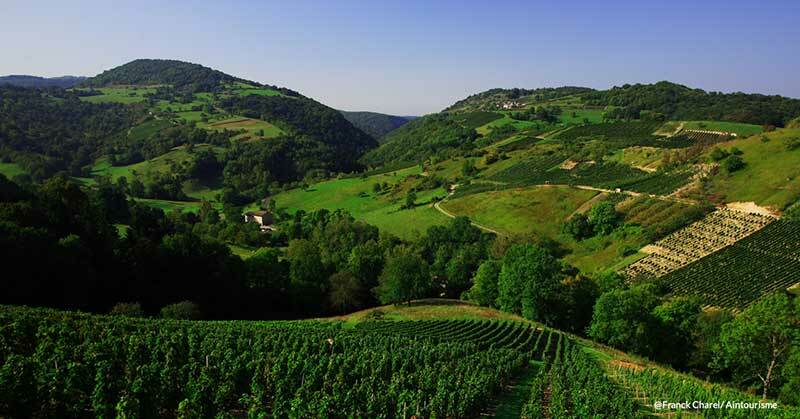 Bugey’s 500 hectares of vines cover a diverse, contrasting landscape, yet its three production areas – from Cerdon to the banks of the Rhône – complement each other beautifully, producing a wide range of wines with something to please every palate. And last but certainly not least: Cerdon Wine. An incredibly easy-drinking, low-alcohol, sparkling wine which is produced by the méthode ancestrale, an ancestral process of making bubbly wine. Described by wine connoisseur Jon Bonné as “the happiest wine on Earth”, it is sure to tantalise your taste buds! 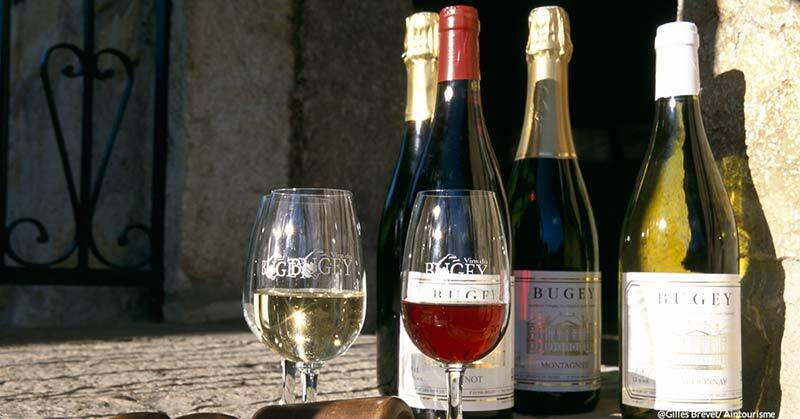 From your starter through to dessert, there’s an AOC Bugey wine to go with every course! Vineyards & Discoveries, for unforgettable, stress-free holidays and weekend breaks! In Bugey, around 60 different winegrowers, restaurant owners, hosts, heritage sites, event organisers and leisure activity providers have been awarded the Vineyards & Discoveries (Vignobles & Découvertes) label, the only label nationwide to guarantee high-quality services and facilities for tourists who want to discover France’s vineyards. They will each take the time to invite you into their world, demonstrate their expertise, and introduce you to the terroir and its history. From diverse soils and exposures, a variety of excellent wines were born, labelled AOC since 2009. Making Cerdon Wine is all about balance and subtlety. To start with, Poulsard and Gamay grapes are subtly blended before undergoing an ancestral production method using no added sugars or yeast. Smooth is perhaps the best term to describe this low-alcohol wine, nicknamed “Ladies’ Champagne”: a delicate, lightly sparkling rosé which pairs delightfully with dessert. The production area stretches over 10 municipalities around Cerdon Village, and almost 130 hectares of vineyard. Every spring, a festive atmosphere takes over Bugey and you are invited to meet with producers and discover their wines at Le Printemps des Vins du Bugey. The event is organised by the Union of Bugey Wines and takes place on a different site each year.